The month of March was a busy – and successful – one for SUNY Cobleskill’s National Professional Agriculture Student Organization (PAS)/Collegiate Farm Bureau Chapter. 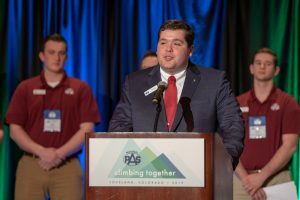 That may be expected when one of their own, sophomore Seth Browe, is the newly-appointed president of the organization. 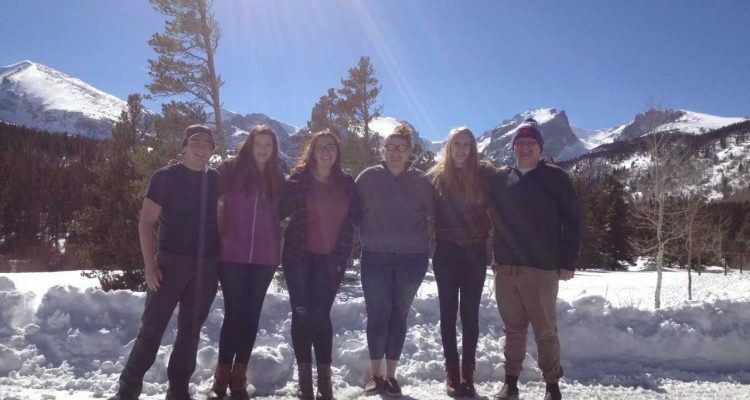 At the PAS National Conference in Colorado on March 13 and wrapping up March 16, seven SUNY Cobleskill students, including Browe, joined more than 600 students from across the country for a weekend of networking, knowledge-sharing, and competition. In addition to partaking in professional development workshops, attending sessions led by industry professionals and specialists, and, in Browe’s case, ascending the organization’s administrative ranks, two SUNY Cobleskill teams placed in the top-10 in the dairy specialist competition. Of nearly 40 competitors, Laura Littrell and Tracy Rudgers finished in the top-10 in the individual competition. The dairy specialist competition consists of a general knowledge test, as well as an on-the-spot presentation of current industry events. President Seth Browe addresses a national audience. SUNY Cobleskill also provided one first place competition winner, and a second place finisher. Lyndsey Weykman took top honors in the agricultural education specialist event, where she was tasked with writing and delivering a lesson plan to a team of judges acting as students. Abigail Armstrong, meanwhile, finished as the runner up in the career planning competition. As a group, the Coby contingent put a bow on their conference with a semifinal appearance in the Quiz Bowl. Browe also currently serves as president of the SUNY Cobleskill PAS/Collegiate Farm Bureau chapter, is active in the leadership of SUNY Cobleskill’s Alpha Gamma Rho colony, and works as a research assistant in the Institute for Rural Vitality. He says in his new position he intends to take on active roles in hiring, finance, and general organizational development.